Business Statistics, Third Edition, by Sharpe, De Veaux, and Velleman, narrows the gap between theory and practice-relevant statistical methods empower business students to make effective, data-informed decisions. With their unique blend of teaching, consulting, and entrepreneurial experiences, this dynamic author team brings a modern edge to teaching statistics to business students. 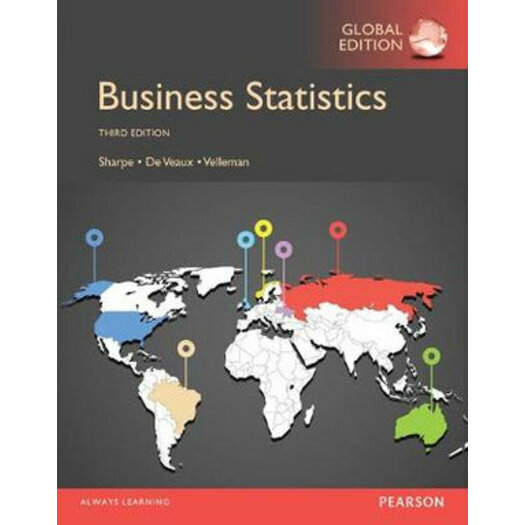 Focusing on statistics in the context of real business issues, with an emphasis on analysis and understanding over computation, the text helps students be analytical, prepares them to make better business decisions, and shows them how to effectively communicate results. Grounded in modern business, this text provides a real-world context for statistical concepts, preparing students to be successful in the business world. Practice and support: Study tools throughout the text prepare students to analyze and interpret data. NEW! Improved organization and a streamlined design make the text more accessible than ever. Please note that the product you are purchasing does not include MyStatLab. Author : Sharpe, Norean R.